a big tub filled with warm relaxing bubbles......the giggles of children hiding in the same old places......deep embracing hugs from people you love.....these are the real decorations of a home. So come on in and let’s “decorate” for a while. Things are far from perfect here, but that’s where the real beauty lies....finding contentment just in the “now”. and ordered some new dishes. 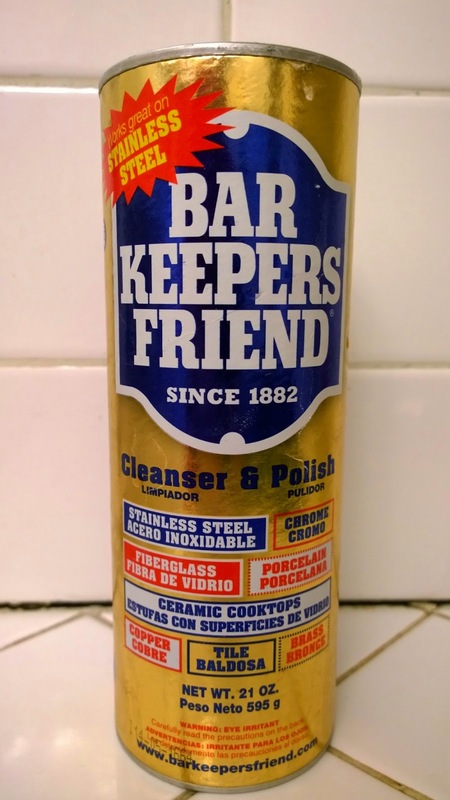 Bar Keepers Friend to remove the marks. At first it didn't work so well for me. I was using a cloth and it seemed like the progress was slow. small amount of water I got much better results. nothing else I tried worked this well. 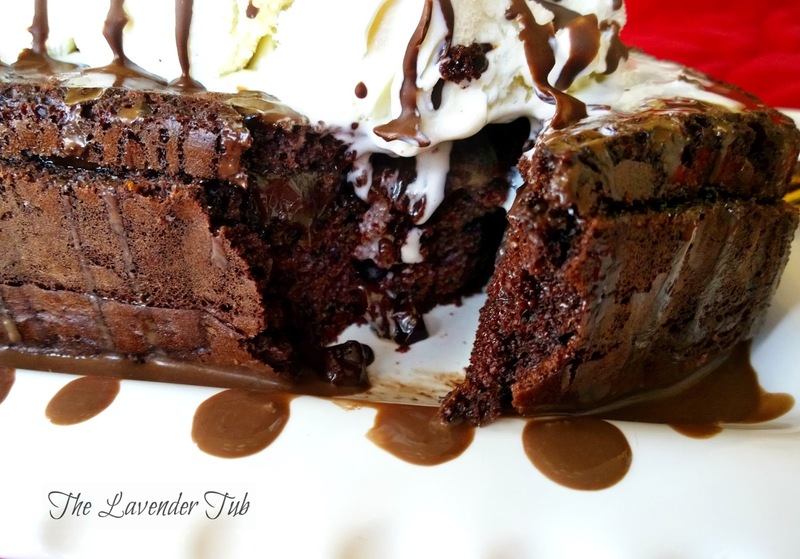 Nothing says "Be My Valentine" like chocolate, especially warm, gooey, molten chocolate. Here is my easy version of this delectable dessert that is every bit as good as a restaurants. The first step is to make a batch of truffles, which is so much easier than you ever imagined. I double Martha Stewart's recipe, found here. Put chocolate into a large heatproof bowl. Bring cream just to a boil in a small saucepan over medium-high heat; pour over chocolate in bowl. Stir in liqueur, if desired. Cover with plastic wrap; let stand 10 minutes. Stir until smooth. Let stand until thick, about 15 minutes. Pour chocolate mixture into a shallow 8-inch dish or pie plate. Cover with plastic wrap, and set aside. If you decide to go ahead and make some truffles, click on that link and you'll see the complete instructions. I omitted steps 3 and 4 for this recipe. Also, you can make the truffles with chocolate chips, just know that the chips most likely will not melt all the way. After you've let the mixture stand for 10 minutes, you can microwave in 15 second intervals to melt them completely, probably not more than 30-45 seconds total. You don't want your beautiful chocolate to seize. 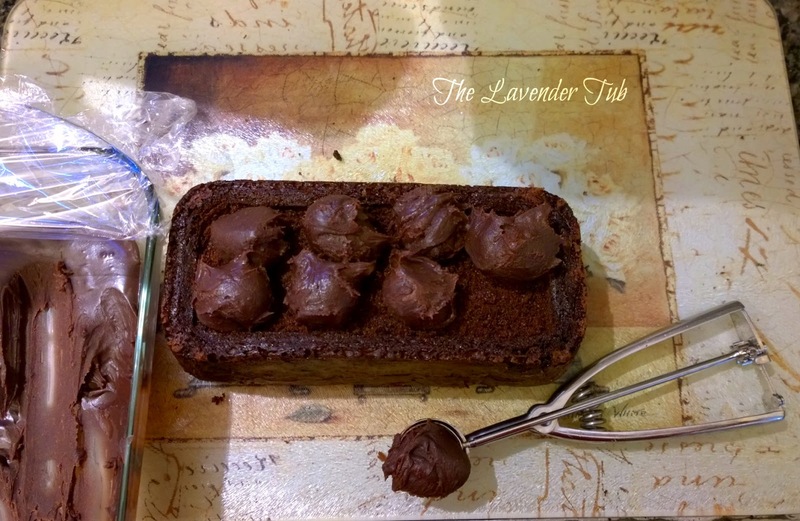 Lavender Tub Tip: This truffle recipe is the same thing as Ganache. You can make it before you sit down to your meal, and simply serve it as a dip with strawberries, cookies, pretzels, etc. for your dessert. However, if you want molten cake, read on. 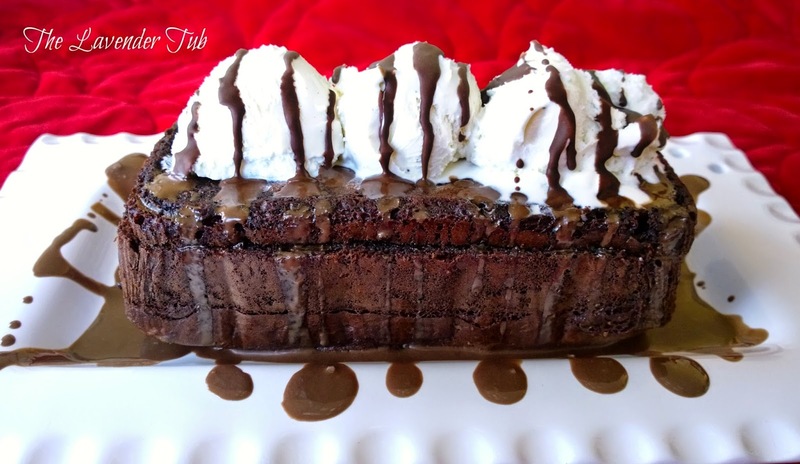 It is completely up to you whether you want to bake chocolate cake or simply purchase one. The shape and size really depends on you. 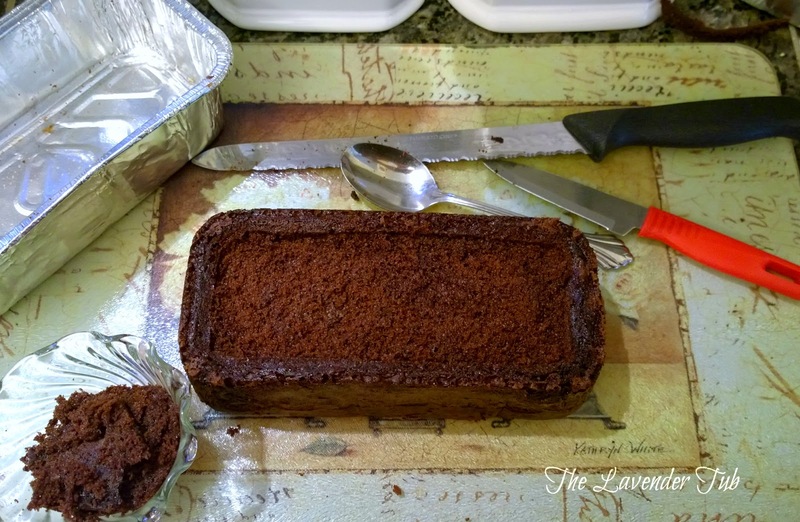 For this post, I baked a cake mix in 2 small loaf pans. 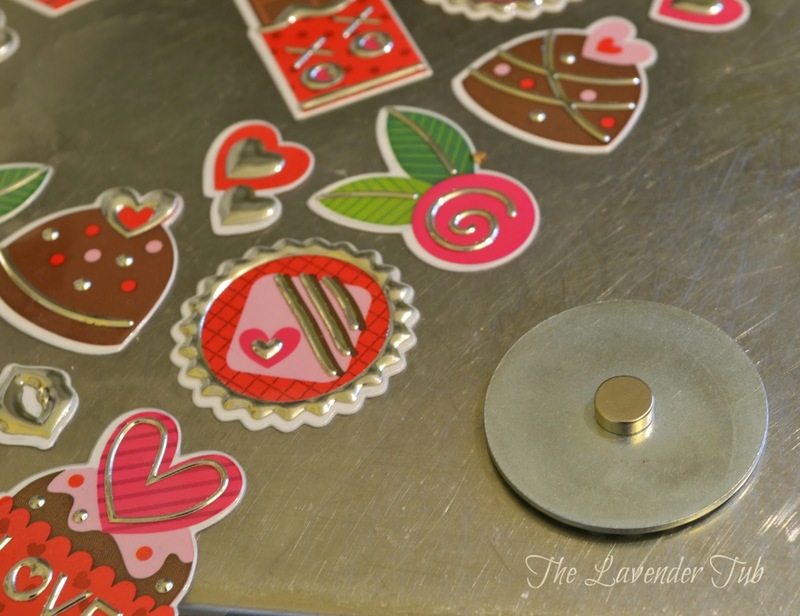 I wanted to make desserts large enough to share with my Valentine, but you could also do them as individual servings by using cupcakes. Cut a 1/2" slice off the top of the cake and set it aside. Using a spoon, scoop out a small trough to contain the melted chocolate. Using a small scoop or spoon, fill the trough with the truffle mixture. Replace the lid of the cake, and microwave for 60-90 seconds until all of the truffle chocolate is melted. Slightly press the lid of the cake down in order to help ease the melted chocolate into the cake. This also creates a small bed to hold the ice cream. Top the cake with ice cream, and garnish with the Magic Shell. Serve and Enjoy! I think easy and delicious....is a beautiful thing! Have you been trying to think of a nice dinner for Valentine's Day, but the thought of going out is ridiculous - and who wants to cook all day? I mean seriously! I was watching Rachel Ray today and she was making an upscaled version of Eggs Benedict. She had a pan going with leeks and garlic to which spinach was added. She had a pan for homemade Bechamel sauce, another for poaching eggs, and she had 4 different containers to bread and fry the eggplant for the dish. 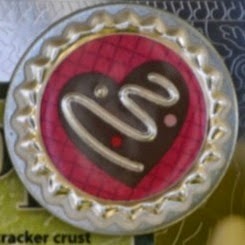 I love you, Rachel Ray, but if that's what it takes to be romantic - no thanks! Here's an idea that requires only a little cooking, but it's so yummy you'll be glad you stayed in. The secret: fresh from scratch Alfredo sauce that only takes about 6 minutes to make. Alfredo sauce from a jar is just plain blechy to me. 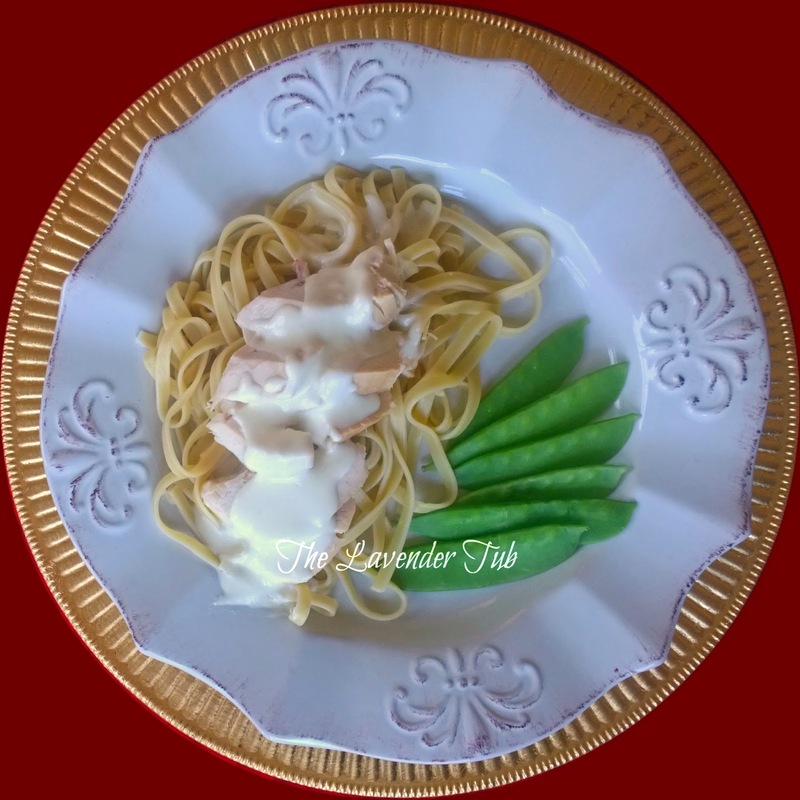 For a long time I tried to make Alfredo sauce, but it never turned out. It was always globby or rubbery. 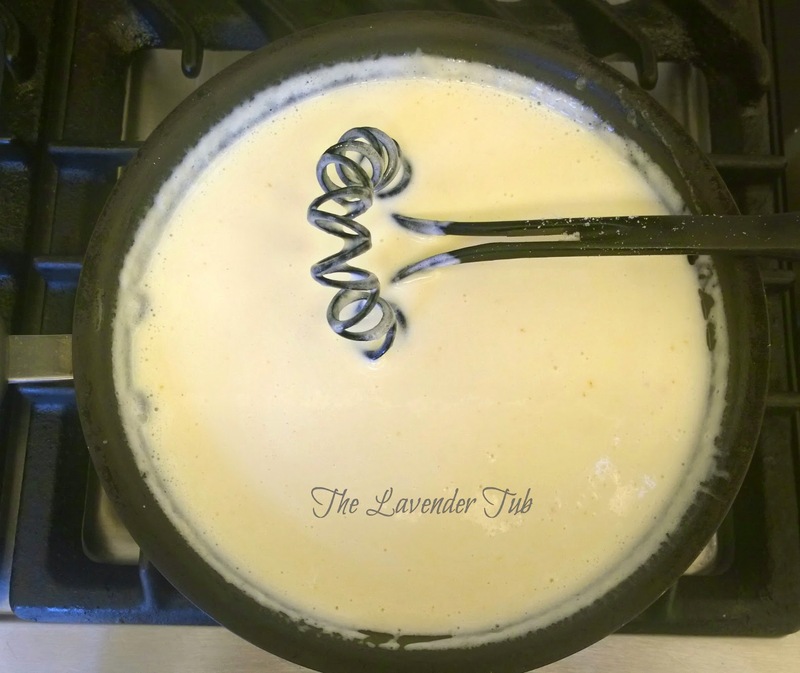 This recipe is the result of my many trials, and if you follow it precisely, you should end up with a delicious, smooth, creamy Alfredo sauce. Finely shred a wedge of Parmesan cheese until you have two cups. This is one of the very important steps, and the only slightly labor intensive part of this entire meal. If you want good results the Parmesan must be freshly shredded. You do not want any of the shreds from the store. You can shred it earlier in the day, just be sure to keep it well sealed so it doesn't dry out. 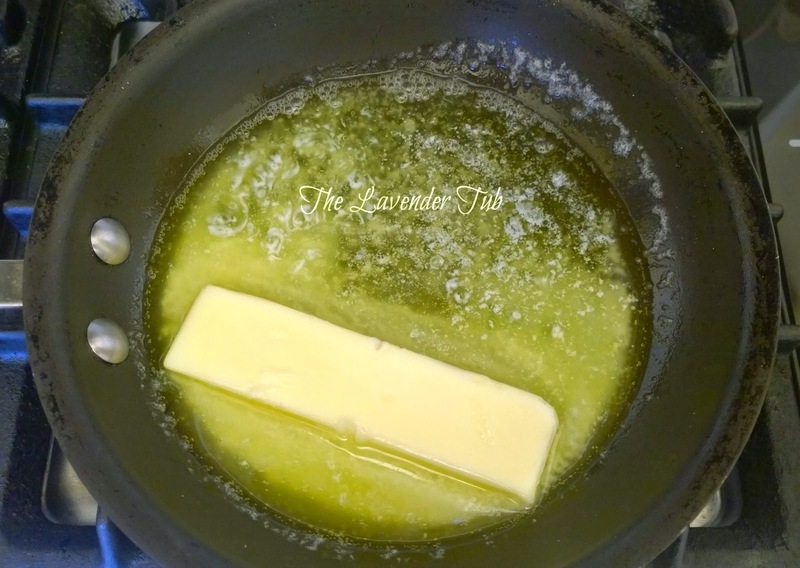 Melt a stick of butter (not margarine) in a sauce pan on med/low. You only want the butter melted, but not browned at all. Add a cup of heavy cream (yes, heavy - you want this to be yummy, right?). 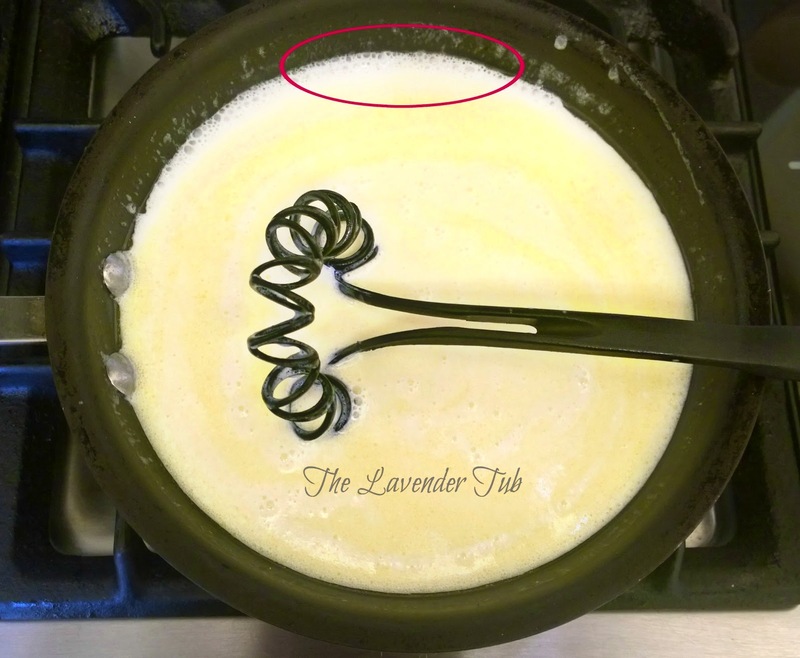 Stir frequently with a whisk until the cream and butter starts to bubble along the edges. The idea is to have a hot liquid, but not boiling. By the way, the black whisk I'm using is Pampered Chef, but from a long time ago. I don't know where to get another like it, but it is such a great tool. Now for the second really important step: Once the cream/butter is bubbling on the edges, take it off the heat and start whisking in the shredded Parmesan. Keep whisking until all the of the Parmesan has melted completely. It is important to remove it from the heat, because that is what keeps it from getting overcooked and rubbery. Add the garlic powder, and that's it! Serve immediately. For Valentine's Day, I purchase precooked chicken, shrimp, salmon, etc. I boil some pasta ahead of time, rinse in cold water, drain well, and store in a plastic bag in the refrigerator. When it is time for dinner, I put meat on each plate and cover it with the pasta. I think doing it this way helps the meat not dry out as much in the microwave. When the meat and pasta are warmed, I rearrange the meat to the top and cover everything with the freshly made Alfredo sauce. Serve with a salad, and you have a lovely, romantic meal. 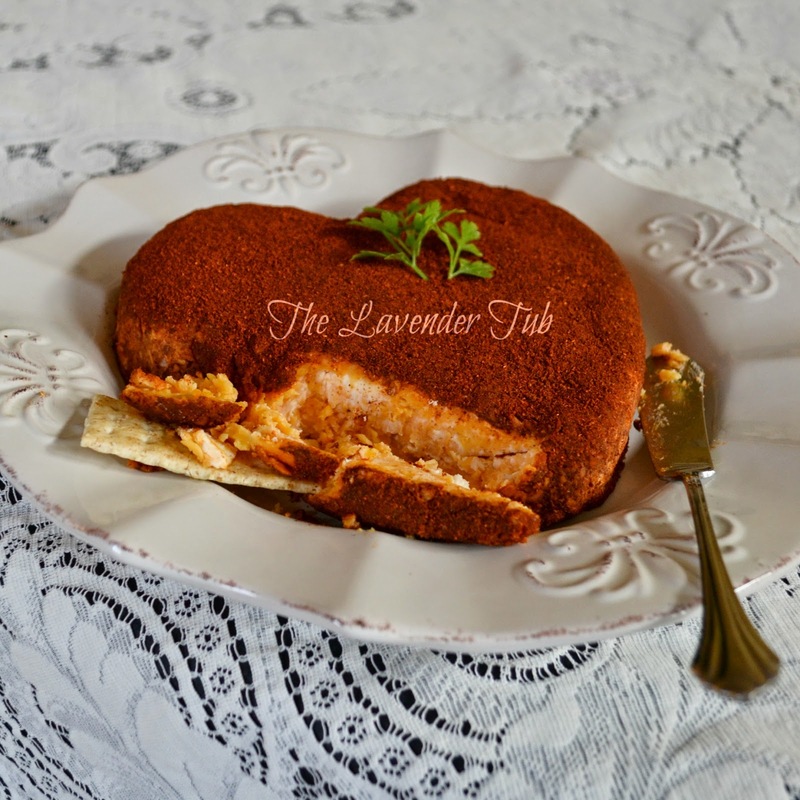 Lavender Tub Tip: If you have leftover sauce, reheat it in a pan over low heat. If you microwave or heat it too high, the butter will separate out of it. Likewise, if your sauce gets too cold while you're heating your Valentine meal, just gently rewarm it, stirring constantly. You don't want the Parmesan to overcook. 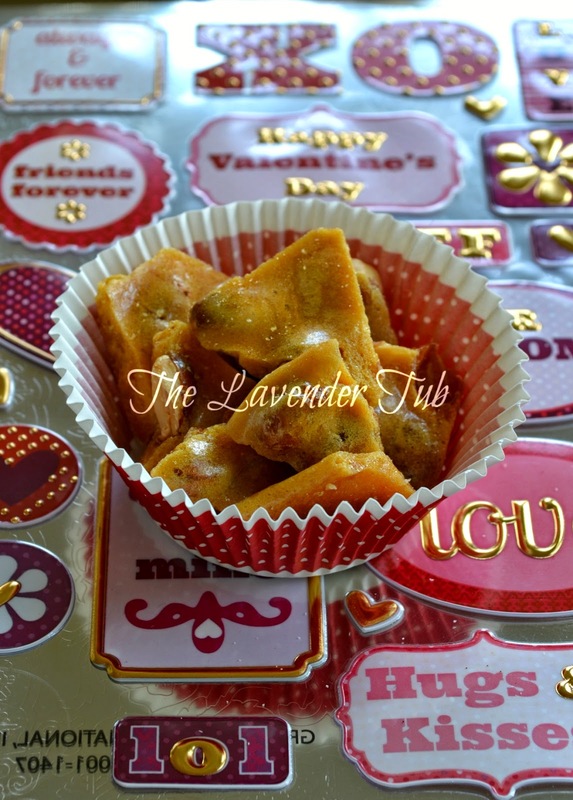 Lavender Tub Tip: You can also have several things ready ahead of time like chicken fingers, pieces of bread, potato wedges, cooked ziti pasta.....anything that would be fun to dip - and just make this a finger food meal. 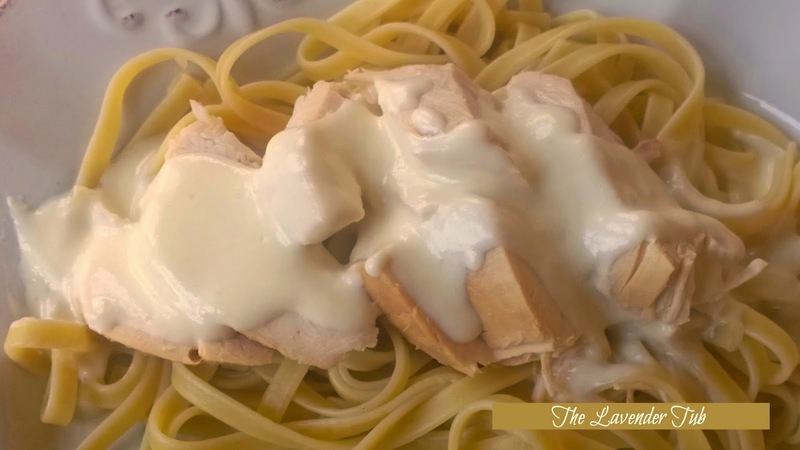 Once the Alfredo is ready, dinner is served! Please let me know how yours turns out, if you try this. And do come back tomorrow! I'll be sharing the dessert for this meal. Click here to view that dessert. 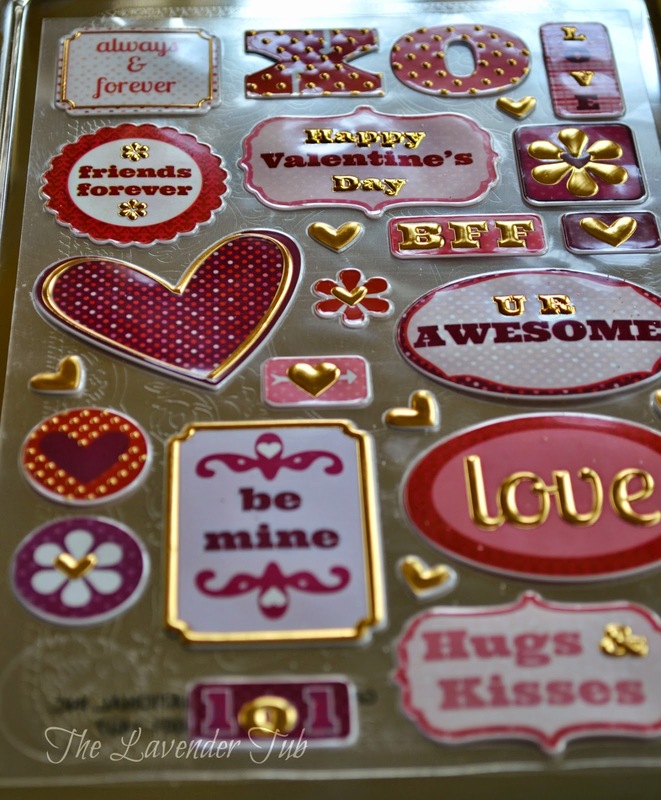 The $ Tree currently has some super cute Valentines Day items, like these stickers. I wasn't sure what I wanted to use them for, but I knew I really needed to think of something. I tested and found they stick quite well to metal washers (I like the ones just slightly larger than the sticker), and metal washers stick quite well to magnets. Voila! Cute Valentine magnets. 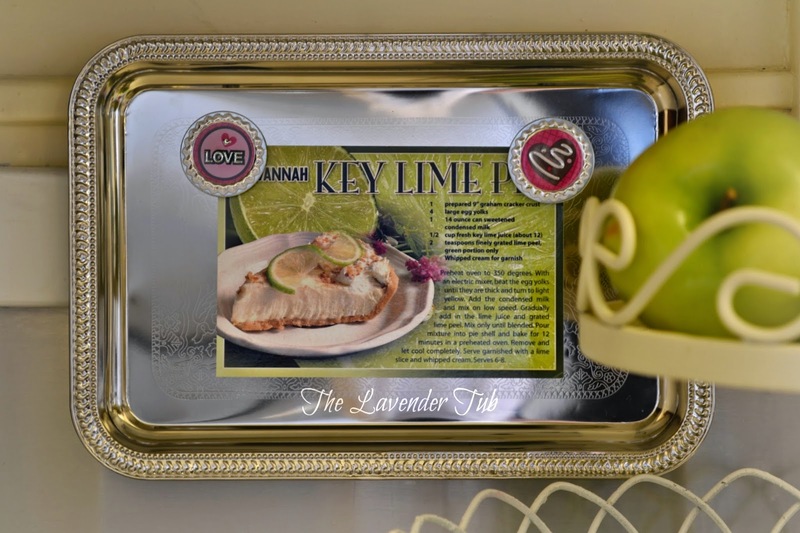 I also checked to see if magnets would stick to the fake metal trays at the $ Tree, and they do! This is great, because I am in need of something to hold a recipe while I'm baking. With the not-so-pretty conduit running under the kitchen cabinets of my 1929 home, I can cover some ugly and create function by attaching the tray to it with magnets. I plan to paint mine antique white, but I wanted to share it this way in case anyone needs an inexpensive idea for a Sunday School or Daycare project. With several kids sharing one sheet of stickers, plus the cost of a washer, magnet, and tray - the holders could be made for about $1.25 each. I think some mommies and grammies would think this was a sweet gift to hold a recipe or picture. Don't you think these are darling stickers? What ideas do you have for them.....I'd love to hear. Peanut brittle can be a tricky candy to make. If you don't cook it long enough, it is so gooey it can almost pull your teeth out. If you overcook it, the sugar and peanuts burn and it tastes awful. I think most people just purchase peanut brittle when they are hungry for it, rather than go through all that hassle. But what if you could make it hassle free? My mom had a great microwave recipe that turned out perfect peanut brittle every time - for her. 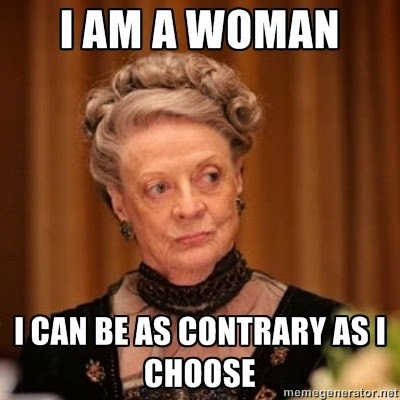 For me.......not so much. As the years have passed, microwave times and temps have changed, and so her recipe did not work with modern models. 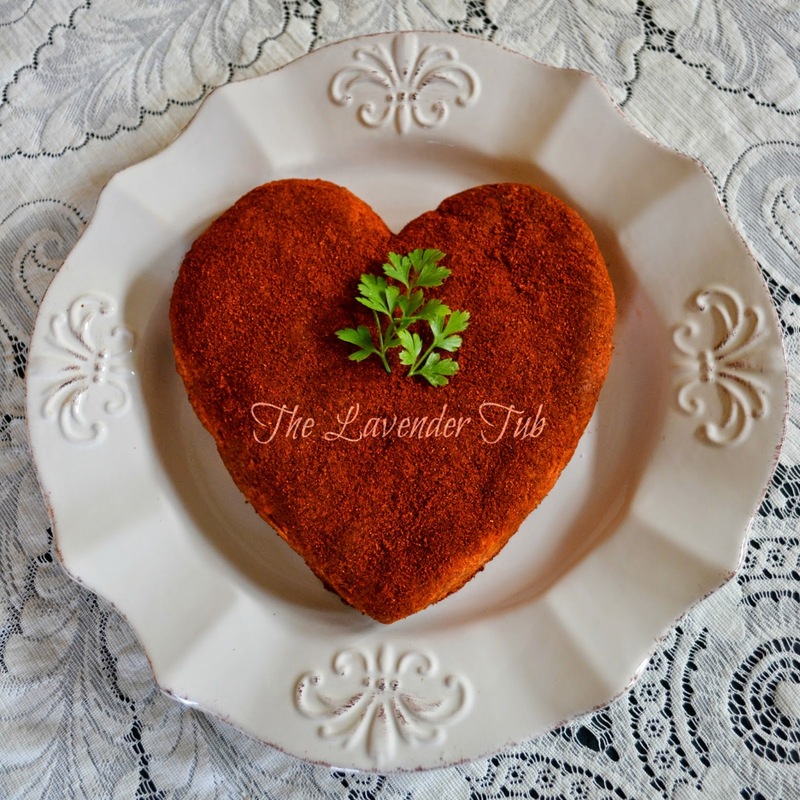 I'm happy to say that after many trial and error batches - I can share a recipe that I think will give you wonderful results each time you make it. I use a large, 8 Cup, heavy, glass bowl to cook my peanut brittle. It gets very hot and it is helpful to see the color, so I would recommend something similar. Butter a baking sheet and set aside. Mix together the white sugar, salt, and light corn syrup. Microwave on High for 2 minutes. (All the microwave times are on High.) Stir in the cup of peanuts, then microwave for 3 minutes. Stir in the butter and vanilla, and microwave on 1 1/2 minutes; stir, then microwave for 1 additional minute. Add the teaspoon of baking soda and GENTLY stir until light and foamy. Immediately pour the mixture onto the greased baking sheet and quickly spread it a bit. Let it cool completely, then break it apart. The back of a soup spoon does a nice job for breaking. Think you want to try this recipe? It turns out so yummy, and there are no candy thermometers, no endless stirring on the stove top, no plunging spoons into cold water........and no guesswork. It's such delicious peanut brittle, I know you're going to want to make it for more holidays than just Christmas. 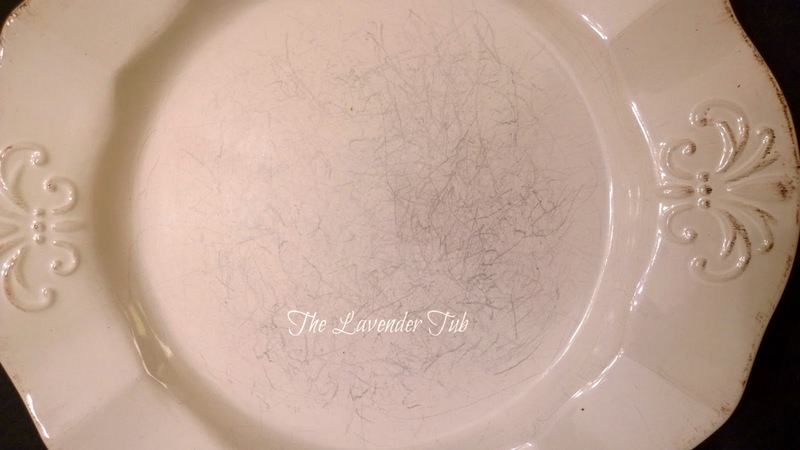 Several years ago I started this blog, The Lavender Tub. I didn't think of myself as a blogger, or really a person that anyone would find interesting enough to follow; I just wanted a place to share some recipes and other "how to" ideas. An insatiable desire to learn and try new things, combined with homemaking skills learned from my stay-at-home mom put me in a position of being a resource for some of my younger friends. It made sense to have a public place to publish information that I seemed to share over and over again. As time went on, however, The Lavender Tub became a place of therapy for me. The death of my remaining parent (both to cancer), a job loss for my husband that lasted two full years, learning of the lengthy abuse of some children I love - which sent me into counseling to deal with issues from my own past - were all so difficult and wounding. 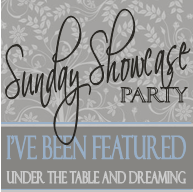 There were wonderful events that greatly eclipsed those painful things - my daughter gave birth to the two, most beautiful children on the planet, my hubby eventually found work and then became a partner in his CPA firm, my boys acclimated to public school from homeschool very successfully, and I even stumbled upon a little business that keeps me in some spending money. Still, the hurt could be so heavy at times. This blog has been a lovely escape for me as I've worked on those hurts. When I was emotionally unable to reach out the way I once did, I found I could still blog and share ideas that might help someone. I could get lost in editing pictures, and learn new techniques as I worked. I could even find a calming joy in remaking a piece of outdated, undesirable furniture into something that is pretty and quite useful for our home. It made me feel like I was Painting Beauty From My Ashes, and healing happened. I wouldn't say I'm 100%, but I'm certainly in a better place than I was. 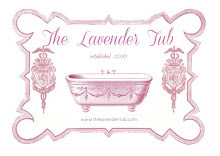 I don't think I will abandon The Lavender Tub, for it is dear to me - mistakes and all. 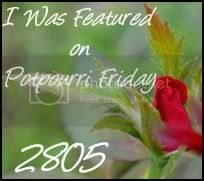 I just wish to have a place to present better pictures with a cleaner format for some of what I blog about. But then again - you just never know! 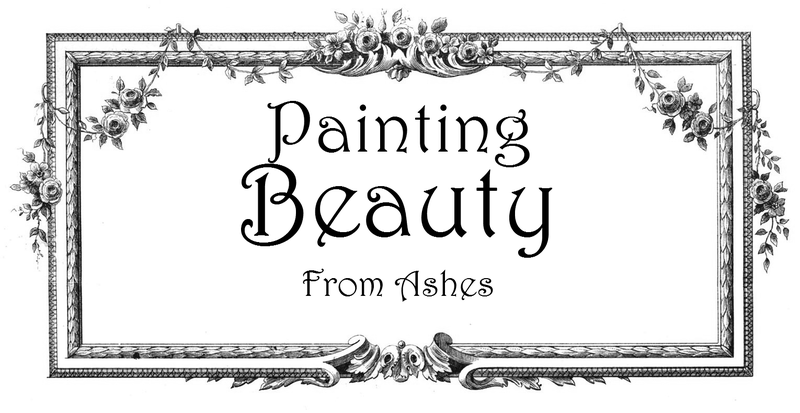 I do hope you'll continue to visit, and please check out and consider following, Painting Beauty From Ashes, here. Thank you from the bottom of my heart for being here for you are the reason I keep blogging, and you helped me through a most difficult time. You will never know how much you mean to me! copies of the recipe at Christmas time! 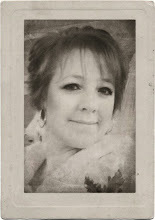 So, if for no one but my family - Here It Is! Combine the cheeses, garlic powder, Worcestershire sauce, and mayo. Mix well with your hands. Shape into a ball, Christmas tree, heart, log, or whatever your mood dictates. On a piece of plastic wrap spread the pecans and sprinkle chili powder over them. (You can mix some pecans into the cheese mixture, but I just coat the cheese ball with them in case someone does not like pecans.) Now, just roll the cheese ball around on the pecans and chili powder until it is completely coated. I usually finish off with some extra chili powder. 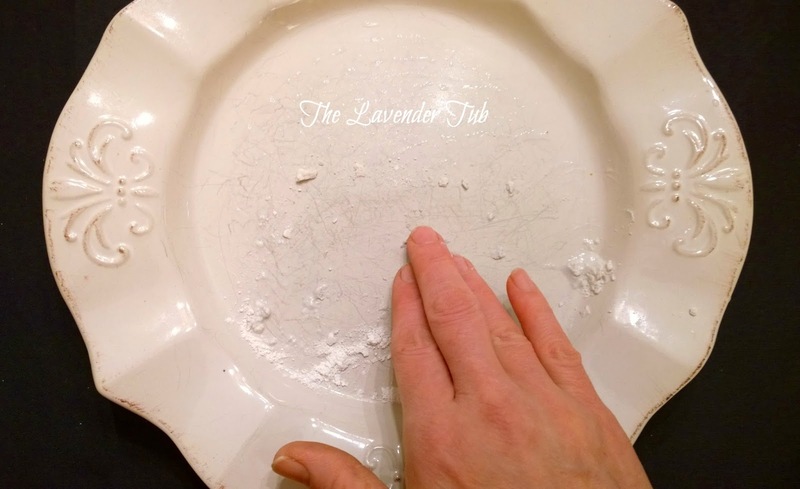 Lavender Tub Tip: I hang on to the plastic wrap with the pecans and chili powder. If the cheese ball is not consumed in one sitting, I can always reshape and roll it again. Sometimes I use the leftover cheese ball in a pan of enchilada casserole - just break it into small pieces and use in place of the shredded cheese. It tastes wonderful. Lastly, if you are watching your carbs, this makes a super yummy treat when eaten with almonds. It really hits the spot when you need something snacky. 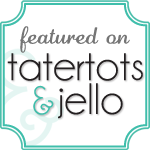 I hope your family enjoys this recipe as much as ours does! At least my family can all pull it up on our phones now! I Heart My Followers!!! You Inspire Me Sooo Much. Thank You! I try to be as original with my creations as possible. 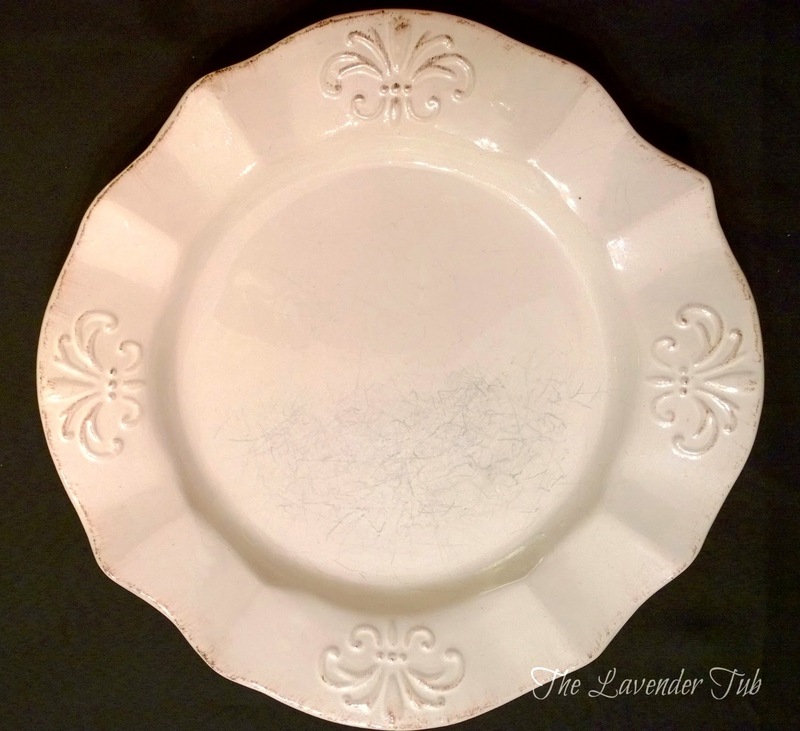 If you like something you see at The Lavender Tub, I'm thrilled for you to share. Just give credit where credit is due. Thanks Lavendears! TKO Orange Oil: The Most Awesome Annie Sloan Dark Wax Tip - Ever!